In 1984, coal miners in the north of England began what would become a year-long nationwide strike and one of the largest mass actions in British labor history. Prompted by Prime Minister Margaret Thatcher’s move to privatize the coal industry, the strike grew to involve over 140,000 miners, their wives and families, as well as a coalition of unions and other activist organizations. 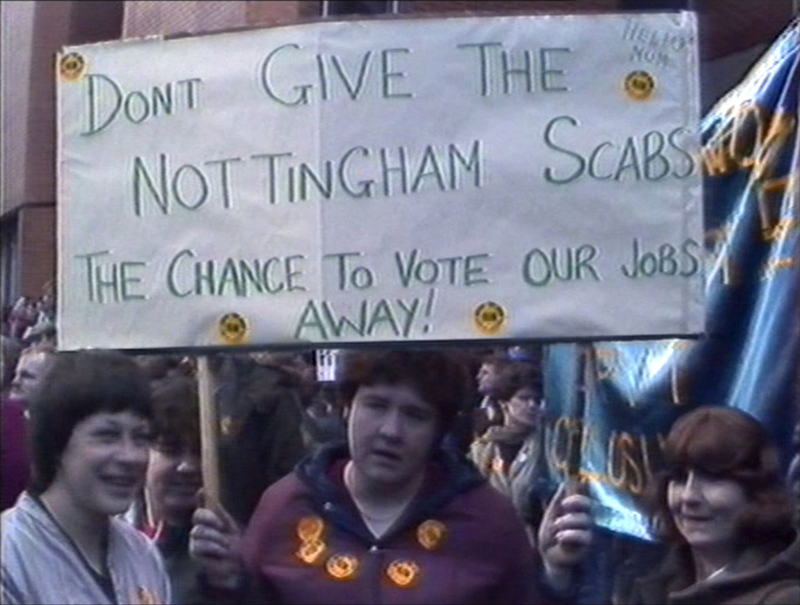 At the strike’s beginnings, a network of young leftist film and video makers from across the UK met in London to determine how they could contribute support; the result was the Miners’ Campaign Tape Project, whose members sprang into action to shoot and edit a series of agitational documentaries that could counter the anti-strike sentiment then prominent in the press. Produced quickly and cheaply, The Miners' Campaign Tapes include footage of protests and clashes with the police, interviews with striking workers and their comrades, historical analyses, critiques of corporate media bias, and brief guides to organizing, punctuated by lo-fi graphics and propelled by dub and new wave pop. The National Union of Mineworkers distributed VHS cassettes of the Tapes free of charge, putting over 4,000 copies into circulation. These videos, in turn, were watched in working-class homes as a form of alternative television, and used for fundraising purposes both locally and abroad. The strike is described throughout as the last stand against authoritarian conservatism: if Thatcher is able to break the miners, it is repeatedly stressed, the loss would signal the downfall of trade unionism and a dramatic decline in working class political power. That the strike ended with the NUM’s defeat nearly a year later adds a melancholy air to any contemporary viewing of the Tapes, but seeing them today also provides an vital example for a newly invigorated global Left. Here is an uncompromising model, recuperated from the past, for how media workers can act in solidarity with the struggles of the present.